Twitter continues to experiment with ways to make conversations on its platform easier to follow. 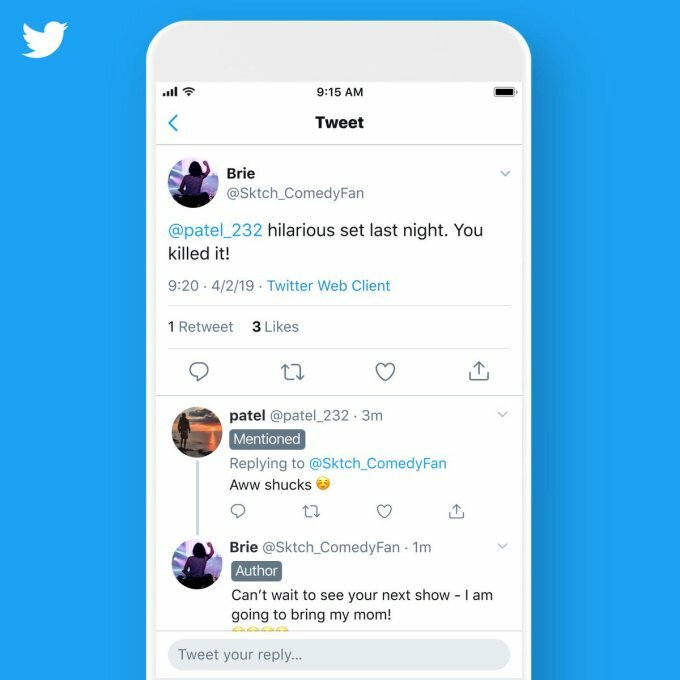 In addition to its prototype app twttr, which is testing threaded replies, the company also recently tested labeling replies to highlight those from the “original tweeter” – meaning it would show when the person who first tweeted a post then replied within the conversation thread. Now, Twitter is changing up this labeling system again. On Thursday, the company said a new test was rolling out which would instead label the “original tweeter” as “Author” – a term that’s a bit more straightforward . “Original tweeter” had been a nod to the commonly used term”original poster,” which designates the person who started a conversation on an internet message board or online forum. But if the goal was to make Twitter easier to understand for those who are less tech-savvy, “original tweeter” may have been more confusing if they weren’t familiar with that reference. “Mentioned” will be added to any tweet posted by someone who the original tweeter…err, Author…had referenced in their first tweet. The “Following” label, meanwhile, will be added to tweets from those Twitter users you’re following, as a way to catch their replies when scrolling through long threads. Twitter’s larger goal here is to better design its app for longer discussions. However, the labels also can help in specific scenarios where the replies to a tweet include posts from a lot of parody accounts. Often, parody accounts have adopted usernames and profile pics to resemble that of the person they’re poking fun at – sometimes inadvertently confusing users and, other times, to blatantly troll or spam.